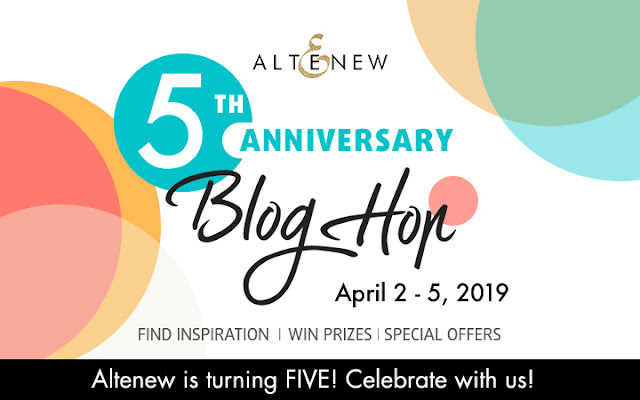 Welcome to the Altenew 5th Anniversary Blog Hop Day 3 + Giveaway!!! Happy Birthday Altenew! 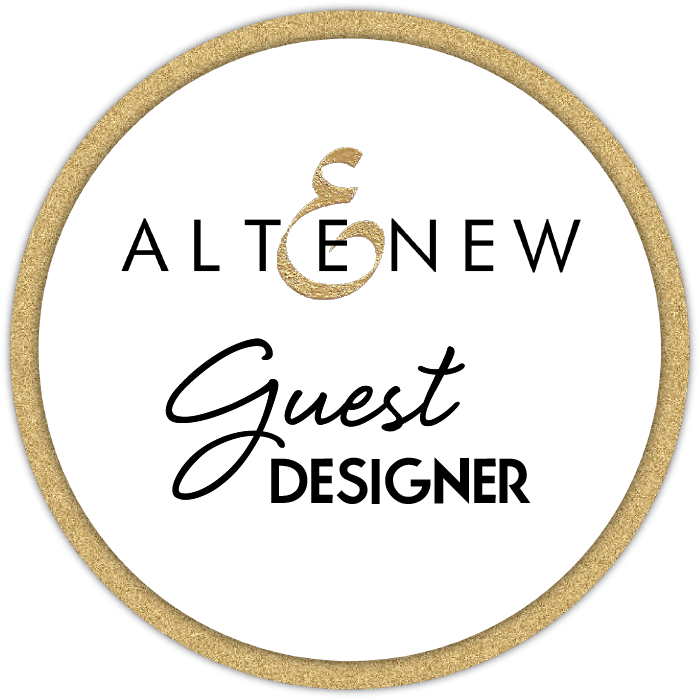 You must be arriving from Virginia Lu's blog..
Today I am so excited to join in the Altenew Anniversary celebrations as i love their products and all the people behind the scenes. My collection of Altenew goodies has grown through the past 3 years, so it was hard to just create one project for this post, so, instead i have worked a small compilation of projects all inspired by Altenew. A cluster of the stamped images was added to the corner of the frame using strong glue and foam adhesive. The sentiment comes from the Envelope Stickers, I simply glued the sticker to cardstock, and trimmed it to form the small banner. A few clear sequins complete the card. My CAS card design makes each of the elements stand out, and i love the striking results in this card. 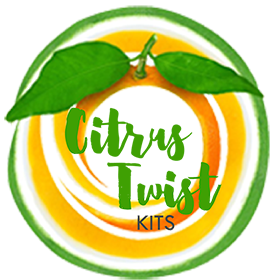 As i mentioned, i had fun creating for this blog hop, and my next project is all about using the Altenew Handpicked Bouquet stamp set and its layering guide to create an entry on my Family Album (Citrus Twist Kits Life Crafted album). One of my favorite Altenew stamps of all times is the newly released Wallpaper Art. This time i chose to emboss the images in gold, and then used the Altenew watercolor pan set to detail them. This was one of those pages that comes together in a moment of inspiration so no video! I added a bit of white acrylic paint to the non-white background and layered the flowers in an "L" shape. The pictures of my niece and daughter were then layered with papers from the Verdant Walk collection, and nestled at the corner of the page. A few embellishments from the Live Your Dream collection were added to the page. 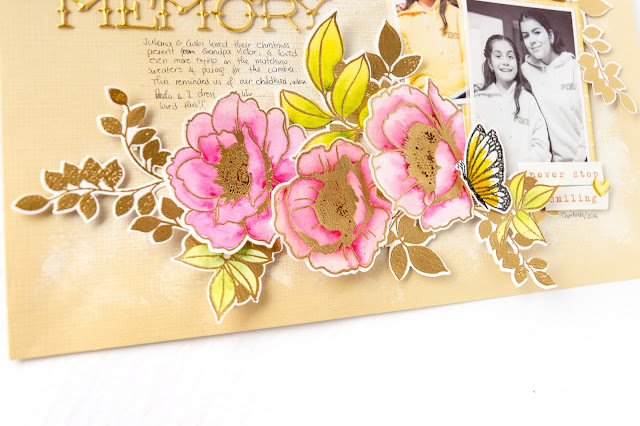 The final touch of this page are the small butterfly images created using the Dream Big Stamp and Die set in conjunction with the Altenew inks. Truly love how this turned out, and how easy it came together. pm EDT. Not valid on prior purchases. Cannot be combined with other promo codes. Now to the fun part of the hop... PRIZES!!! Thank you so much for your comments and don't forget to leave a comment for a chance at one of the prizes. If you have questions, please contact me. Beautiful creations..I loved the card as well as the layout ! Versatile indeed! I love seeing all the ways to use these gorgeous sets!!! The card is outstanding love it and so are the projects that you have shown...beautiful work. Your 3 creations are amazing! I love the middle project the most I think for the composition and simply my love of your color palette. Thank you for sharing your beautiful art! Love your work! Thanks for the inspiration. What beautiful work you have done! I especially liked that you used Altenew markers because I am now collecting them and I think they are great! Such pretty ideas for this stamp! Thanks for the inspiration Nathalie! I love Altenew products! I save and save so I can buy more! I can't have enough! Happy Anniversary Altenew! Thanks for the inspiration. Love the last layout with the soft background and gorgeous flowers. Your stamped flowers are very lovely! Altenew has the BEST flower stamps! Happy 5th Birthday Altenew! Beautiful! Happy Birthday & Congratulations to Altenew! Wow! Your card is so lovely, with that resin frame, but the layout is stunning! Blown away! Love the card with the resin frame but your layout was absolutely awesome. Would love it if my layouts look half as good as that one. You are truly talented. Very beautiful creations from you for this 5th Anniversary for Altenew. I especially loved the card and the layout page. Gorgeous! I love that you used that frame on a card. Genius! I really love that wallpaper art stamp set too - it is on my wish list. Your projects are all beautiful. Great ideas for using Altenew products for different projects. The card is my favorite! Happy 5th anniversary to Altenew! Very beautiful projects and isn't gold embossing like the most amazing thing on flowers? I am sure I'm neither the first nor the last stamper to be "lured" into this craft by a good floral embossed in gold! Happy 5 to Altenew! What wonderful designs. Love the use of the frame. Awesome job. Thanks for sharing your creativity! All 3 of your projects are beautiful. Thanks for sharing them with us on this fun Altenew hop! 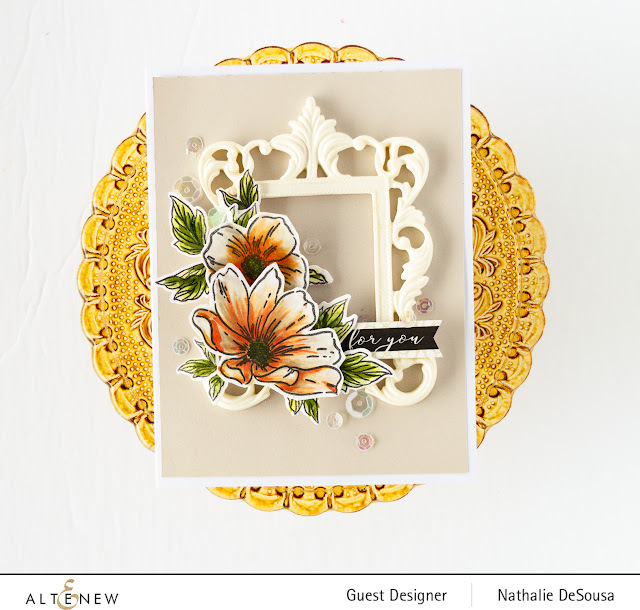 Love your wonderful samples using the beautiful Altenew flowers stamps. Great card and I love the embellishment! So pretty. The layouts are are beautiful and I love the family album great ideas! Lovely creations!! Your coloring is stunning!! Really like the card. The family album is also very nice. Fabulous design as always Nathalie! Thanks for sharing all your masterpieces, your LOs are fabulous! Happy anniversary to Altenew! Fantastic projects! Beautiful card and layouts. Such lovely creations! Love the wallpaper art stamp set! 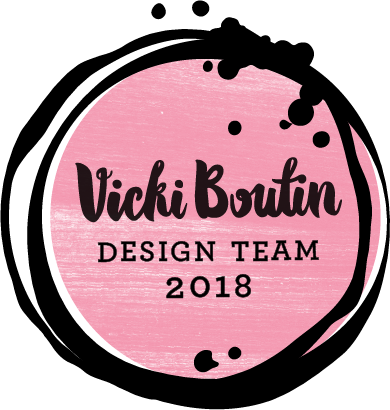 delightful projects - really love your card design!! Thanks for sharing your talent. Your projects are creative and inspiring. I just love your style! So creative! Beautiful projects. The styles and colors are gorgeous. I loved ALL of your projects. Your card was absolutely gorgeous. I especially liked the way you use the Handpicked Bouquet stamp set on your family album. Stunning! Beautiful coloring! I love the layout and the colors you chose! Your scrapbook page is amazing and so beautiful! Thanks for the inspiration. Happy anniversary Altenew! Very pretty I really like your coloring thank you for sharing. 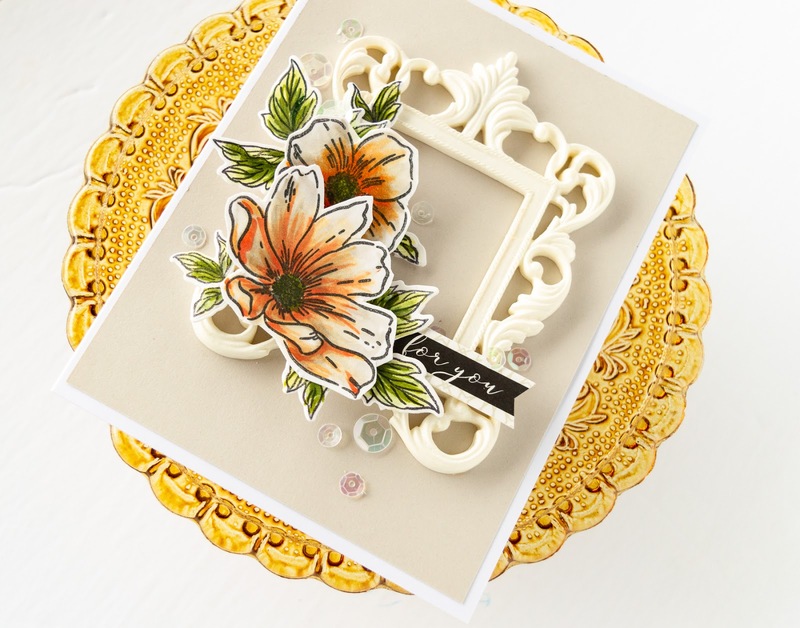 Stunning CAS card and your page layouts are beautiful, lovely water coloring to complement the pretty pics. Wow, your projects are all stunning!!! These are gorgeous creations, love the colour combos too! Truly gorgeous projects, Nathalie! I love your shading on the flowers in your first card. Beautiful colors. Amazing projects!! Thanks so much for sharing. Lovely projects! Love your use of the Altenew florals. Oh my, what beautiful projects. I loved your layouts so much...and the one using the frame was just gorgeous....by the way...super sweet photos....what a happy layout! Thank you so much for sharing today. All your projects are beautiful. Lovely designs. Definitely gotta get a hold of those artist markers! Your projects are stunning. The colors and layouts just fabulous! Thank you so much for sharing your talent! Very beautiful projects and adorable too! The frame on your card adds the "WOW" factor!Thank you for sharing. Your card is so breathtaking. Love your scrapbook page too. Happy Anniversary Altenew. Many more years of success. What STUNNING projects!! I think my favorite is that layout too!! 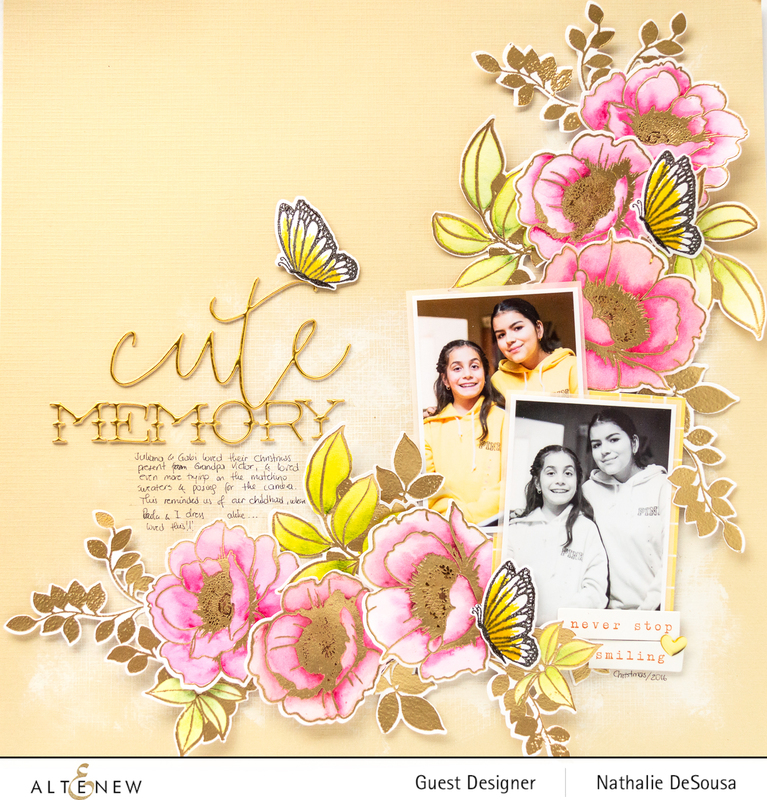 Just love your idea for the frame card and your other projects showcase your awesome talent. All of your projects are great. Beautiful card, and gorgeous layout. Love the look of the flower on the frame and your layout - beautiful. All pretty creations, but I love the card made with resin frame. I've never seen it before your card! That card with the frame is just so stunning and your scrapbook layout is perfection! Thank you for sharing your awesome creativity with us! Nice card and beautiful layouts. Thank you for the inspiration. Happy 5th Anniversary Altenew. The wallpaper art set if gorgeous! Love seeing your different projects. I love your elegant style and gorgeous, peaceful colors! TFS! Three lovely projects, all very creative and elegant. Thanks for sharing and congrats to Altenew! Fabulous card, album and page! Love the colors and your wonderful style. Great projects! Thanks for the chance to win and sharing. Gorgeous projects! 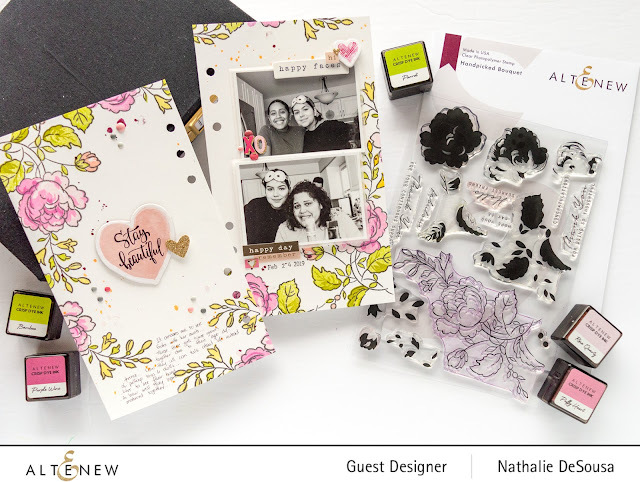 Love your card, album pages and layout! Thanks for joining in on Altenew's 5th Anniversary blog hop! Stunning projects. My favorite was the scrapbook layout. It is lovely. Happy 5th Anniversary! I love your journal page. Altenew has the best floral & bloom stamps. 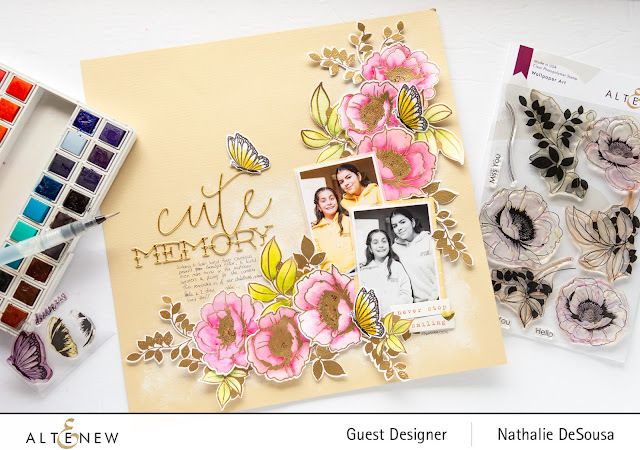 Gorgeous card & layouts Nathalie. Thank you for sharing your talents with us. The scrapbook layout is absolutely stunning! Thanks for sharing! Wow what stunning designs, Love your showcase of these beautiful Altenew products. I’ll be back after I am done Hopping! I love the LOs! Thank you for sharing your creativity and inspiration with us! So beautiful looking card and layouts! I love the colors. Gorgeous work. Thanks for sharing and have a fab time celebrating. stunning LO's. Love the way you stamped around the two pages. Look at those gorgeous flowers on your "Cute Memories" page, so pretty! Wonderful projects!! Thank you for great inspiration. Your card is so pretty but I love your layouts the most. The colors are just so gorgeous. Pink and gold together is always a favorite. Nathalie all your projects are gorgeous. Congratulations to Altenew on their 5th Anniversary. I always love your beautiful cards. Your journal pages are so fun. I love the Wallpaper Art florals. Your projects are all gorgeous but I’m partial to the layout with those yummy flowers. wonderful - love the journal and the scrapbook page as well! I love the pinks and yellows on that last layout! What a beautiful card and such pretty layouts!! Thanks for sharing yoour beautiful projects. Wow a beautiful card and love your book project. They are both beautiful! I do not scrapbook, but I would want it looking like your page. It is awesome! Thanks for sharing your talent! Wow Nathalie, what a gorgeous projects did you made for this blog hop. The beautiful colourd card with the frame, the awesome family album pages and the great scrapbook layout, I love them all! I love the frame you added to this card. It looks amazing! You have created such lovely projects!! Gorgeous creations! Love the pretty flower images you used.... so, so pretty! The resin frame is lovely behind the pretty flowers. Happy Anniversary to Altanew! Happy Birthday Altenew and many more! Beautiful cards and layout! You made 3 beautiful, creative projects ! Thank you for sharing ! Beautiful! I love seeing the layout pages as many ideas are for cards. Thank you! 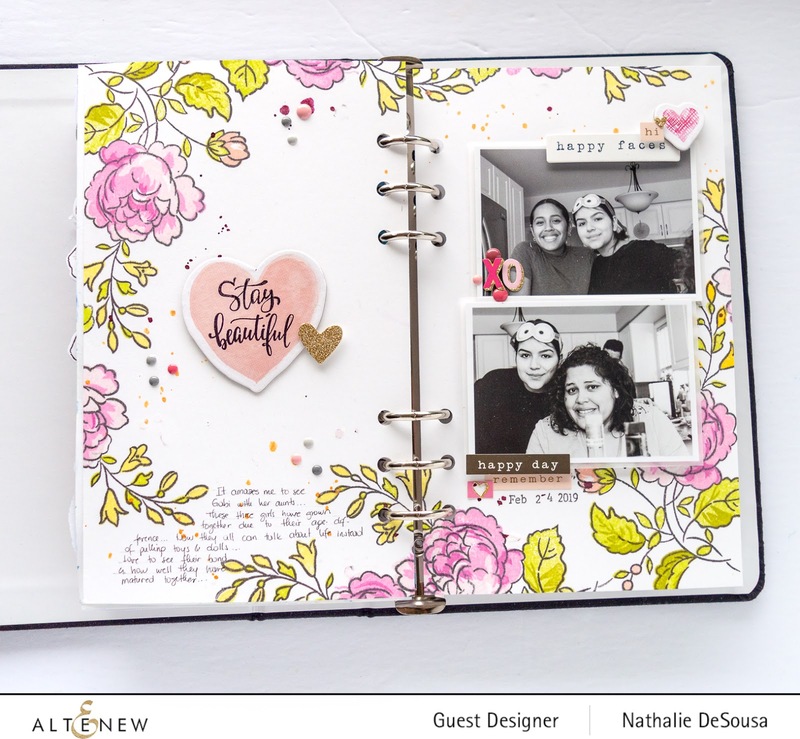 Those peonies look super awesome against that frame, and I ALWAYS love your traveler notebook pages, but that layout is just over the top gorgeous! You reall aced all three of these projects today. Thank you for always sharing your amazing talent and inspiration with us here in the blog hops. i love your beautiful card design & the soft pretty flowers on your family album but, I agree, the layout is perfection! LOVE those gorgeous flowers!! Wonderful creations, Nathalie - all so different - thanks for sharing your talents with us! All of your projects are beautiful. I think the one with the Wallpaper Art stamps is my favorite. Thanks for sharing. Your card is so classy! Such beautiful and creative projects! The layout is so soft and pretty, and the addition of the butterflies to your page was the perfect touch. 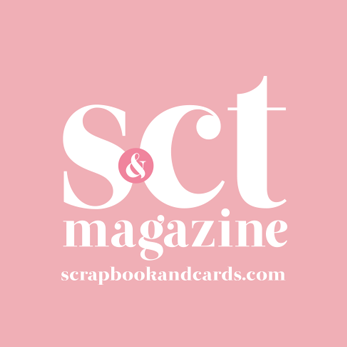 STUNNING card and FABULOUS pages! LOVE ALL the GORGEOUS flowers! Your card is especially DELIGHTFUL with the dimension of the frame and layers against the soft detail in the petals and leaves - WOW! 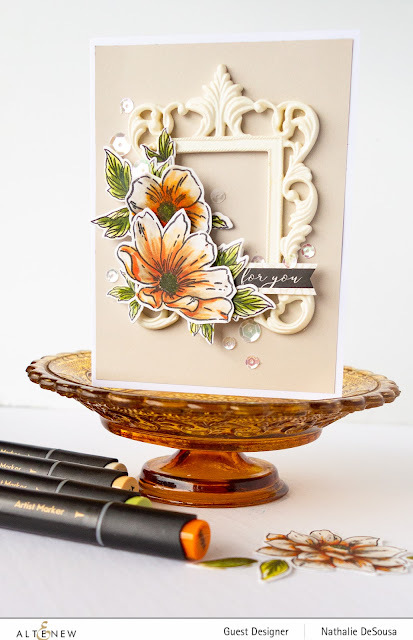 Beautiful projects - I love the sweetness of the flowers against the frame, and your last layout is stunning - fabulous colouring. ivory frame on the first card. All of your projects are so beautiful. And I agree, you saved the best for last. That Wallpaper set is amazing. Thanks for the inspiration! Your projects are all beautiful. I agree that your scrapbook layout is a favorite. It is very pretty. I love the design and your flowers are colored beautifully. I like the frame on your card. It adds a touch of elegance. So many lovely projects. Great job showcasing Altenew's fabulous products. These are truly amazing! And so professional looking! I LOVE your work! What a great breadth of projects! I particularly like what you do with off-whites and neutrals; it adds such elegance to your projects. Thanks for sharing them with us! Wow! Thanks for the amazing inspiration! Congrats to Altenew on turning 5! I have loved their designs right from the first release. Wishing them many more years of fabulous success! Gorgeous projects - I love the frame on the card - so pretty and elegant! Wow, you were busy!! These are all fabulous; specially that first card with the elegant frame! Beautiful! The frame is such a unique idea and I love the gold details you embossed in the layout! I love your layout. The flowers are gorgeous!! Thank you for sharing. Fabulous projects! I love your layouts! Such pretty projects!! Your page is awesome! Great pages and love the framing on the card. Love the multi-media in your card, just lovely and your layout is beautiful too. Happy Anniversary Altenew! Beautiful, lovely designs!!! Happy Anniversary Altenew! Love your layouts and coloring on your flowery card. Thank you for posting.